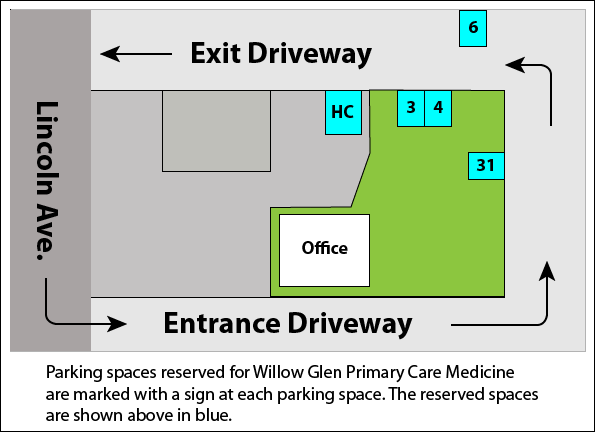 You may park in our designated parking spots, 3, 4, 6, 31 and handicapped parking as shown in the figure above. "I will be forever grateful to Dr. Lindsay"
Dr. Lindsay is the best diagnostician I have ever had. I was a long time patient of hers, and joined her new Concierge practice after I developed a painful hip condition that greatly limited my ability to function. I went to multiple specialists and had several procedures, but continued to suffer. I developed a rare autoimmune disease that freaked out my old primary care doctor. He didn’t know where to begin to help me and didn’t seem to be very interested in what I was going through. A family member recommended Dr. Lindsay, and we immediately connected on the first visit. What did you think of your visit? © 2018 Willow Glen Primary Medicine. All Rights Reserved.